The color of the bride's wedding dress is one of the most important aspects of a wedding. 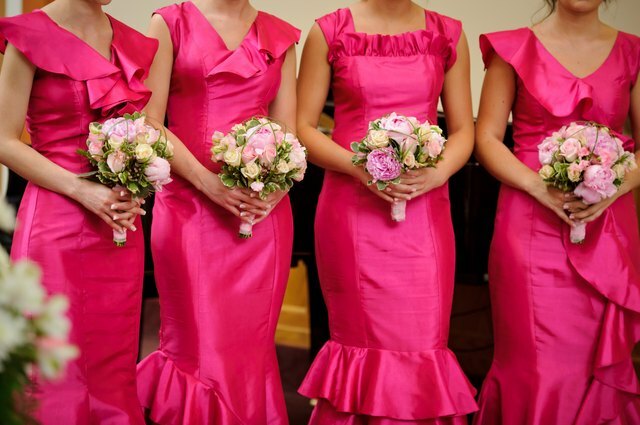 The colors of bridesmaids' dresses for a wedding are also important. Colors set the tone and theme for the wedding. 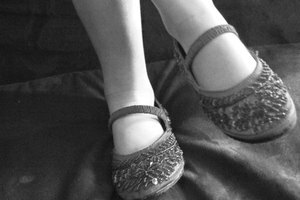 They are the first thing the guests will see and they are one of the things that everyone remembers. It is important to get all aspects of the color coordination for a wedding just right. Choosing bridesmaids’ dresses that complement the ivory color of the bride’s dress is a big part of wedding preparation. Several factors aside from the color of the bride's dress must be taken into consideration when choosing the color scheme for the bridesmaids' dresses. The color theme for the venue and the wedding is a consideration, as well as the couple’s tastes. The bride’s wedding dress is the major factor, as the bride is the main focus of the wedding. The colors chosen for the bridesmaids’ dresses must complement the bride’s wedding dress, not clash or detract attention from the bride. The time of day will also affect the color chosen for bridesmaids’ dresses, as will any themes for the wedding. The season will also need to be taken into consideration. Ivory is an off-white color, with a slight tint of yellow. It is a popular choice for wedding dresses. Several colors work well with ivory. The choice of colors for the bridesmaids' dresses is limited only by the bride’s tastes. Pastel colors are a good choice for bridesmaids' dresses. The pastel shades are sufficiently soft that they will not detract from the bride’s ivory wedding dress. Pastel shades are soothing on the eye and popular with women. They will fit with most decors and themes and can be used in any season. Monochromatic shades will work well with ivory. If the bridesmaids wear black, the ivory of the wedding dress will be outstanding in the wedding party, ensuring that the focus remains on the bride. Black dresses are also a popular choice with women. If contemporary styles are used, the bridesmaids may also be able to add these dresses to their wardrobes, recouping some of the costs. Complementary colors for ivory from the color wheel are light sea greens, light browns and tans, light oranges, light grays, and dark orchids. For weddings, browns, grays and tans are not popular options due to their dull tones. Light sea green, aqua, lavender and orchid shades will all work well for bridesmaids’ dresses. The bridesmaids should be allowed some input into the choice of colors for their dresses, as they are the ones who will be required to wear them, and often, pay for them. The bride will have to take their tastes into consideration when choosing the colors of the bridesmaids' dresses, along with her main concern of the color of her wedding dress. What Is a Formal Dress Code?